Lead Story: New testimony just released by federal investigators shows that close calls at O&apos;Hare were much closer — and more extreme — than originally thought. The investigation highlights two cases of barely averted mid-air collisions involving planes taking off at the airport in May and August of 2011. 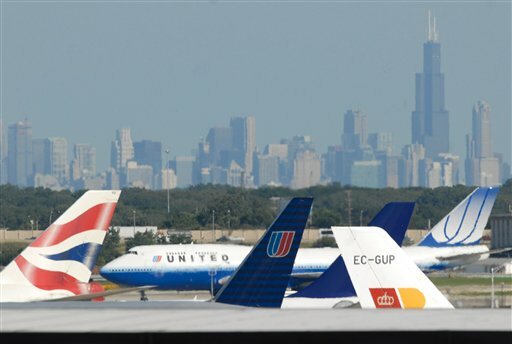 The report, conducted by the Federal Aviation Administration, doesn’t place direct blame on any one party, but it does reveal some huge flaws in O&apos;Hare&apos;s layout. In both cases the FAA credits quick thinking by pilots for averting disaster. Scarily, the Chicago airport isn’t alone in facing issues of runway safety, in part because many major airports don&apos;t have room to expand. And thus my love affair with Amtrak is rekindled. Also: Thirty years after the Tylenol murders held Chicago — and the nation — captive, the case is getting a fresh look. A task force continues to focus on James Lewis; he was convicted for extorting Johnson & Johnson over the cyanide-laced pills but was never charged for any of the seven murders. Meanwhile, the Sun-Times reports that a new grand jury could be convened based on new evidence, including testimony from potential witnesses. Much of the physical evidence is circumstancial, though, and not it&apos;s up to state prosecutors to decide whether or not to go forward with the case. Check out Chicago Magazine&apos;s stellar oral history for more on the case and its 30th anniversary. And then: If you missed it yesterday, please take some time today to explore the map of Chicago&apos;s ever-shifting gang territories put together by WBEZ&apos;s own Elliott Ramos. It’s a fascinating look at one of the greatest factors in the city’s ongoing rash of violence. Take special note of the sidebar that provides previous years’ territory maps so you can see how these shifting boundaries have contributed to gang warfare, particularly on the South and West Sides. RIP: Another atrocious game of bad calls by the NFL&apos;s replacement referees cost the Green Bay Packers a win over the Seattle Seahawks Monday night. A last-second Hail Mary by Seattle quarterback Russell Wilson resulted in an endzone scrum for the ball; a Green Bay defender appeared to intercept the ball, which would have clinched victory for the Packers. But the replacement refs instead gave a tie-goes-to-the-offense ruling to Seattle, giving them a miraculous win. The tie call is the right one — provided both players catch the ball simultaneously. But as video evidence shows, that’s not what happened. Not only have the replacement refs now cost a team a game, they’ve also jeopardized player safety by not reinforcing penalties for vicious hits and illegal blocks (just ask Tony Romo and Darrius Heyward-Bey). So much for NFL commissioner Roger Goodell’s crusade for player safety that spurred his over-zealous “bounty” punishments of the Saints. This photo of two replacement refs making opposite calls in last night’s game side by side will forever represent this dark period in NFL history. Things are getting pretty grim with Spain&apos;s economy these days. A new report says that drone strikes in Pakistan have not made the U.S. any safer and instead have killed a lot of innocent civilians. A man in Florida was arrested for an alleged carjacking, which was actually an attempt to get his pregnant girlfriend to a hospital after she went into labor. If you’re going to be a burglar, be sure to get the proper amount of sleep so this doesn’t happen. Bad news for Netflix subscribers who love Hoarders: The service is dropping shows carried by A&E and The History Channel. A controversial pro-Israel ad that recently went up in New York City subway stations could head to Chicago next. Mayor Rahm Emanuel is taking a stand against one alderman’s proposed plan to tack on an extra fee to energy bills to help pay for more police officers. A local high school basketball coach fired for writing a graphic self-help book is now suing the school district that fired him. The CSO musicians strike has come to a pretty quick resolution because that’s how Mozart would have wanted it. Authorities in Evanston continue to search for a Northwestern student who’s been missing since leaving a party on Saturday night. Sox Watch: The Sox remain a game up on the Tigers after a thrilling victory over Cleveland powered by a pair of Adam Dunn homers. It was just a shame less than half the stadium was full to see it. The European Ryder Cup team is wary of a “raucous” American crowd that may be present when the tourney gets under way here later this week. Bears head coach Lovie Smith is hopeful that Matt Forte will be back in the Bears’ starting lineup next Monday night against Dallas. Don’t hold your breath for that NHL lockout to be resolved any time soon. An interesting take on Mitt Romney and those Olympics he touted so much. PBS’ Off Book has posted some terrific videos over the last year. This newest one on the art of web design is no exception.